At the US-India Friendship Council (USIFC) congressional reception are seen from left to right: Rep. Joe Morelle (D-NY); Senator Tim Kaine (D-VA); Swadesh Chatterjee, Chairman of USIFC; Rep. Raja Krishnamoorthi (D-IL); and Rep. Brad Sherman (D-CA). Photo by Geeta Goindi. 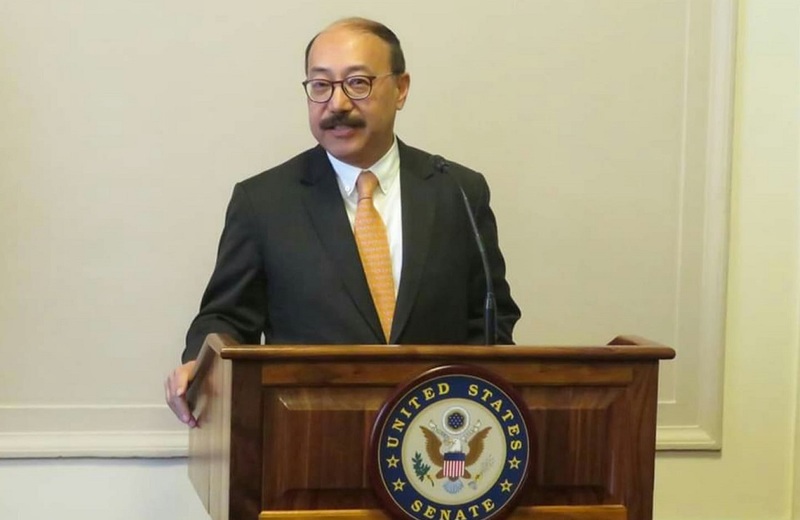 Ambassador Shringla credits US Congress, diaspora for boosting bilateral ties. WASHINGTON, DC – US lawmakers from both sides of the aisle have pledged strong congressional support for the relationship with India while underscoring the myriad contributions of the Indian diaspora to American polity, economy and society. Senator Tim Kaine of Virginia, Democratic vice presidential candidate in 2016, declared, “The relationship is very strong,” noting India and the US are connected in culture, democratic traditions, entrepreneurship and innovation. 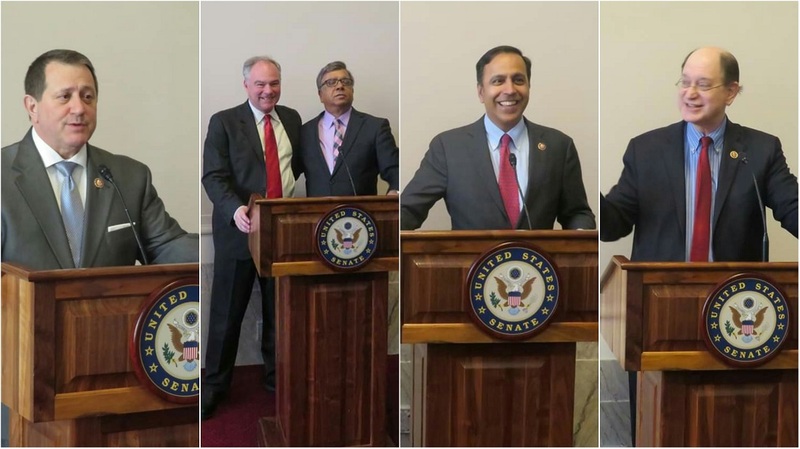 “And we are connected because the Indian American community in the US and in Virginia is so very strong,” he told an enthusiastic gathering on Capitol Hill for a Congressional Reception hosted by the US-India Friendship Council (USIFC). The event, spearheaded by community stalwart Swadesh Chatterjee and supported by the Indian Embassy in Washington, drew a number of Indian American activists to the Senate Russell Building on a Wednesday evening in early Spring. Rep. Brad Sherman of California, Chairman of the powerful House Foreign Affairs Committee, told the audience that he has been serving in Congress for 22 years and has steadfastly “been a proponent of the US-India alliance.” The lawmaker is the new Democratic Co-Chair of the Congressional Caucus on India and Indian Americans, popularly called the House India Caucus. “It’s not a great joy that India faces security challenges and needs to buy $15 billion worth of arms,” he told the USIFC reception. “Given the challenges that India faces both to the north (China) and to the west (Pakistan), it is not surprising that India has decided to acquire our most advanced weaponry and has been only one of the non-NATO countries to buy the most advanced weaponry from the United States,” he said. Indian Ambassador Harsh Vardhan Shringla addressing the US-India Friendship Council congressional reception on Capitol Hill. While paying homage to “the 40 Indian law enforcement officials that were killed in an act of terrorism just a month ago,” Sherman said, “I have been condemning China for preventing the (United Nations) Security Council from imposing sanctions on the leader of Jaish-e-Mohammad. And who else deserves sanctions more than somebody that would plot such an attack?,” he asked criticizing Beijing’s action. “India and the US share so many things. Unfortunately, we share being the victims of international terror. I look forward to working with India on (matters of) mutual security,” the lawmaker said. The Indian envoy told the gathering, “All the people I’ve met across the board — whether it is in the administration, in Congress, media, academia — have all emphasized one factor: they look to a very strong India-US relationship. So, there is bipartisan support for this relationship and something that we really appreciate,” he said. New Delhi’s top diplomat in Washington noted that “there is a strong reason” for burgeoning India-US ties and credited the Indian diaspora for much of the progress. With a graciousness that is refreshing given his high office, he said, “Besides the fact that India today is one of the fastest-growing, major, emerging economies in the world,” accounting for 17 percent of GDP growth all over the world, “we have such a vibrant and dynamic Indian American community represented in this country. Clearly, the success of the Indian American community as professionals – doctors, technocrats, scientists and, of course, as entrepreneurs, has been an inspiration to many of us in India. And today, support of this community is vital to us” in forging a much stronger relationship with the US. Looking across the packed room, Shringla told members of the Indian American community, “You are our partners, you are our interlocutors – as people who have settled in the United States, who have been successful” and “you are still strong supporters of a good relationship between our two countries. You are physically present in the US, but your heart is, I’m sure, in India. You are looking to contribute both to your country of origin and your country of citizenship. In that sense, you are the bridge. As Swadesh Chatterjee pointed out, you are the ambassadors of India, far more than any of us could hope to be. Thank you very much,” he said. What seemed like a response to US trade pressure, the envoy pointed out that the “US is India’s largest trading partner” and “India is buying much more from the US” now, than in previous years. President Trump has announced plans to end special trade treatment for India claiming it shuts out American businesses. Together with Chatterjee, the ambassador recognized the contributions of USIFC leaders Dr. Bharat Barai, recipient of the 2017 Pravasi Bharatiya Samaan award, and Raymond Vickery, among others, and thanked Jason Isaacson of the American Jewish Committee for advocating strong ties between India and Israel. Congressman Raja Krishnamoorthi, one of four Indian American lawmakers serving in the US House of Representatives, recalled that Chatterjee with other community leaders helped to pass the US-India Civil Nuclear Agreement in 2008, a watershed moment in the history of the bilateral relationship. “That really showed the Indian American community coming of age in terms of building those bridges between the US and India that will last,” he said. “India is vital for our security,” he said, adding that commercial and people-to-people ties help to sustain both the world’s oldest (US) and the largest (India) democracies. Imploring more Indian Americans to run for office, Krishnamoorthi told the Capitol Hill gathering, “If you dream it, you can do it! The fact that a guy like me with 31 letters in his name that 99 percent of my constituents cannot pronounce is testament to the greatness of this country and the fact that anyone can do anything they want to do in this country,” he said. Referring to the “tremendous relationship between the United States and India,” Republican lawmaker Steve Chabot of Ohio emphasized it “is extremely important. We certainly recognize that in the House and Senate,” he said. “The administration, I believe, does as well. We need to continue to work together to improve it” and “to improve trade opportunities,” he added. Noting that there is “great potential” for further strengthening India-US ties, Republican Congressman Don Bacon of Nebraska stressed, “Countries that embrace freedom and human rights have to work together.” India and America – nations which respect individuals, freedom, human dignity, private property, and believe in free markets – have the potential to build on shared values, he said. The GOP lawmaker noted, “We have common worries” and, in this regard, he mentioned China. “I don’t think they are an enemy,” he said indicating they are a potential opponent. “India is the number one target of terrorists,” he bemoaned. Bacon represents the 2nd Congressional District of Nebraska which encompasses the core of the Omaha metropolitan area. “In Omaha, we have approximately 10,000 Indian Americans and they do so much for our local area,” he told the USIFC audience. “Our communities are blessed by the Indian Americans who immigrated here,” he added. Congressman Sanford Bishop said, “The relationship between India and the United States is one that is very, very good and I hope we can work together to make it even better.” The Georgia Democrat mentioned he has a number of Indian American friends from all walks of life – doctors, architects, business leaders, hoteliers, retailers – who “are almost family. The diaspora is so strong and so powerful in business and in our personal relationships,” he said.